One hundred and eighty years ago, on 20 June 1837, Princess Alexandrina Victoria of Kent acceded to the throne of the United Kingdom as Queen Victoria. 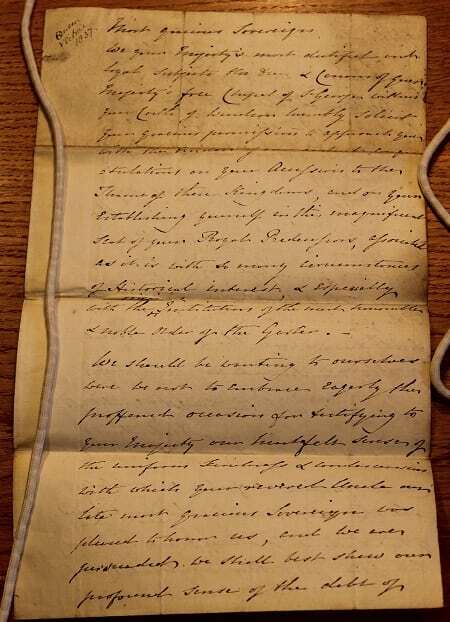 The document pictured here [SGC XI.C.73] is a copy of the Loyal Address offered by the Dean, Henry Lewis Hobart, and the Canons of Windsor to Queen Victoria on this occasion, as an expression of their allegiance to her as the new monarch and head of the Church of England. We your Majesty’s most dutiful, and loyal subjects the Dean & Canons of your Majesty’s free Chapel of St George within your Castle of Windsor humbly solicit your gracious permission to approach you with the tender of our ardent congratulations on your Accession to the Throne of these Kingdoms, and on your establishing yourself in this magnificent seat of your Royal Predecessors, associated as it is with so many circumstances of Historical interest, & especially with the origin & Institution of the most honourable and noble Order of the Garter. We should be wanting to ourselves were we not to embrace eagerly this proffered occasion for testifying to your Majesty our heartfelt sense of the uniform kindness & condescension with which your reverent Uncle our late most gracious Sovereign was pleased to honour us, and we are persuaded we shall best shew our profound sense of the debt of gratitude which we owe to his memory by our undeviating loyalty & devotion to your Majesty. We have beheld with the most lively interest the watchful care of your illustrious Mother in impressing your Majesty with the paramount importance of the sacred tenets of our holy Religion, well knowing that the lessons derived from that hallowed source are found to be the only sure guarantee of every virtuous principle & the finest support in all those trials from which the most exalted station of Earthly grandeur is not exempted. They finish with a prayer that Queen Victoria may be enabled by divine grace to govern & direct the Councils of these Kingdoms that the true Intents of both Church & State may continue to prosper. Queen Victoria went on to rule the United Kingdom for sixty-three years (a record only surpassed by our present monarch, Queen Elizabeth II, who has thus far reigned for just over sixty-five years). Throughout her reign, Queen Victoria had a fondness for Windsor Castle and developed a close relationship with the Dean and Canons, as a result of which many royal occasions were celebrated in St George’s Chapel. An exhibition of material from St George’s Chapel Archives currently on display in the south quire aisle explores the theme of celebration and commemoration during the nineteenth century, when a large number of royal baptisms, marriages and funerals took place at Windsor.